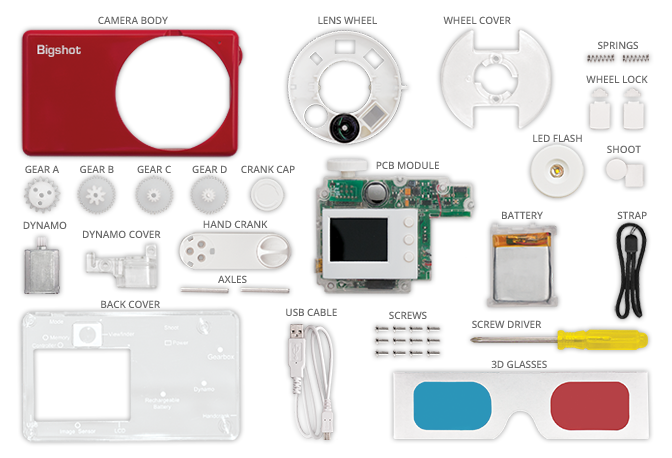 Make your own digital camera! Explore what's inside it. Browse the interactive book to learn all the underlying concepts − optics, mechanics, electromagnetism, electronics and more! Low battery? Just rotate the hand crank a few times and continue to shoot your photos! Ever taken a 3D photo? Simply rotate the lens wheel to switch between regular, panoramic and 3D modes.